KRK's glass-aramid cone technology sets a new standard with even better performance and accuracy! KRK's Rokit G2 (Generation 2) powered studio monitor is designed to give amazing performance and accuracy for the home or project studio. The G2 Rokit has radically curved edges which virtually eliminate diffraction and provide a wider sweet spot. The Rokit G2 also features a great looking cabinet with a front-firing bass port and KRK's trademark yellow glass-aramid composite woofer and soft-domed tweeters. Dual high-power amplifiers in each speaker and active crossovers provide smooth and accurate reproduction. The Rokit monitor has the most accurate response curve in its class ensuring that you hear all of the details in your mix. The KRK RokitG2 Series takes value-priced monitors to a new performance level. 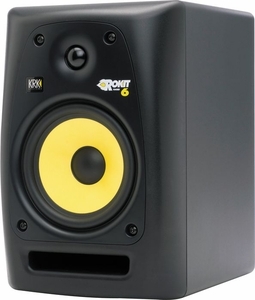 All of the great stuff that Rokit's have been known for (front-firing bass port, soft-domed tweeter, glass-aramid composite yellow cone) are still there, but the G2 Rokit's feature refined voicing and a new curved baffle that looks great, reduces diffraction and provides even better monitoring accuracy. Studio Monitor Series from KRK Systems. For years the Rokit series has been a popular choice for accurate monitoring in studios large and small. Now the all new Generation 2 Rokit studio monitor provides a new standard for even better performance and accuracy, raising the bar once again. Why compromise gain structure to achieve a comfortable listening level? As musicians and recording people themselves, KRK asked that question too. So each Generation 2 Rokit monitor comes with an Input Volume Control that provides an adjustable gain range from +6dB to -30dB. Just another way the Rokit lets you focus on your mix, and not on compatibility concerns. At KRK, the focus is your mix. But it doesn't stop at creating accurate monitors. KRK appreciates the need for monitors that not only sound great but work easily into your particular setup. That's why you'll find plenty of input options with your Rokit, sure to accommodate any studio environment. So if it's RCA, quarter-Inch (balanced/unbalanced) or XLR inputs you require, Rockit has got you covered. KRK took a great monitor series and made it better. KRK's engineers and listening panel took the Generation 2 Rokit's speaker voicing to even more accurate levels. What you hear is what you are intended to hear, coloration is not part of the spec. This performance is brought to you by drivers that are custom-designed by KRK's world-class studio monitor engineering team, for clear, low-distortion performance. While your Generation 2 Rokit monitor leaves the factory voiced to demanding specs, KRK also knows that no two rooms "sound" the same. As such, each Rokit speaker comes equipped with a High Frequency Level Control. This feature provides specific adjustment of high frequency output most commonly affected by room acoustics. It's just one extra level of control that KRK gives you to ensure the most accurate mix for your particular room's acoustics. The new Rockit monitor looks different, so it can sound better, and in a wider "sweet spot". Traditional rectangular speakers suffer from diffraction as sounds leaving the edge of the cabinet are reflected back into the original sound field, and at different time intervals. This phase distortion creates a "narrow" or boxy" sound. The Generation 2 Rokit series eliminates this issue with radically engineered curved surfaces, so diffraction is virtually eliminated. Simply put, you'll get better sound in a wider area. Take a look at competitive monitors and you'll find ports on the back of the cabinet. These rear-firing ports tend to create bass coupling with walls and corners amplifying low frequency information which will color your mix. The superior design of the KRK Generation 2 Rokit's include front-firing ports, which are just the right shape and taper to reduce port turbulence. You'll appreciate the clean and accurate bass performance this approach delivers even at high SPLs. A great sounding monitor doesn't stop with a great cabinet and custom drivers. KRK's true bi-amplified amplifier system provides discrete low-distortion power for each driver. While the active crossover systems provide smooth and accurate frequency response, and again, accurate diffraction control. Note: Monitors are sold as singles.